Two properties that should be of keen interest to Dracula fans have come on the market this year. Bran Castle in Romania, reputed to have inspired Bram Stoker’s Dracula, is being offered for sale by the current owners, two Habsburg royals. It is Eastern Europe’s biggest tourist destination, drawing more than a half million visitors a year. The current asking price has not been made public. According to one report, it was offered to the Romanian government for $80 million. Romania’s royal family acquired the castle in 1920, and in 1944 converted it to a hospital for wounded soldiers. When the communists came to power in 1948 they ejected the royal family from the country and took over Bran Castle – and for reasons unknown, ripped out all the bathrooms in the residential portion. Upon the fall of the Ceausescu regime, the castle was restored to the royal family. They have been running it ever since. Now, in their 70s, they are concerned for the future. 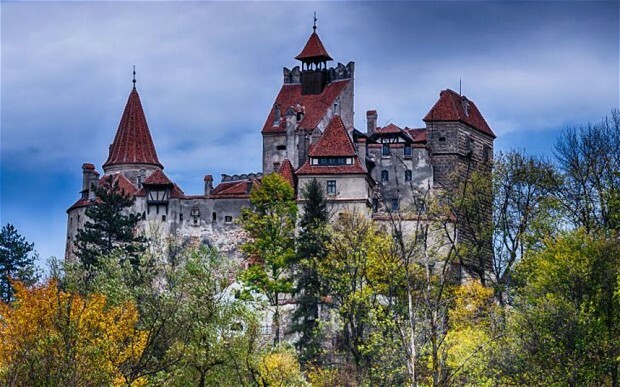 The property trades on its connection to Dracula, however, those spoilsports at the Wikipedia say Bran Castle is just one of several locations linked to the Dracula legend. They say there is no evidence Vlad Tepes knew anything about this castle. Worse yet, at least one scholar contends the location Bram Stoker actually had in mind is an empty mountain top. Well, poop. For those who insist on unquestioned provenance, our second listing is fully documented. Bela Lugosi’s Hollywood Hills mansion, the actor’s residence in the 1930s and 1940s, is for sale. Lugosi may only have pretended to be Dracula, on the other hand, his old home is a lot more affordable than Bran Castle. The sticker price is $4,197,000. The Los Angeles Curbed reports that, built in 1924 and known as “Castle La Paloma,” this mansion has changed hands several times and undergone restoration recently. Set on a 0.3-acre lot, the home has five bedrooms and five bathrooms, as well as a ballroom-sized living room, a formal dining room, a library, a gourmet kitchen and a service wing. According to the listing, the master suite is expansive and features inlaid flooring and hand-made ironwork. This Hollywood Hills home also boasts beamed ceilings, mahogany doors, iron and glass windows, a slate roof and original tile work throughout the 12,000 square feet of living area. The floor plan allows for plenty of natural light in addition to excellent views. This entry was posted in Skiffy and tagged Bela Lugosi, Dracula by Mike Glyer. Bookmark the permalink. Boy, Bela Lugosi’s home looks far more modest in Tim Burton’s movie, Ed Wood. No wonder the guy could afford all that smack! I haven’t seen the Tim Burton movie, though I’m guessing that takes place in the 1950s and by then Lugosi was living somewhere else. Indeed, but the time of his association with Ed Wood, Mr. Lugosi had indeed fallen from the heavens — this house reflects just how much of a genuine star he was earlier in his career. His son, variously styled “Bela Lugosi, Jr.” or “Bela G. Lugosi”, is an attorney in Los Angeles, and I wouldn’t be surprised if extra-legal copies of various briefs in cases he represented bearing his signature were being passed around quietly from hand to hand. I saw that was certainly true of memos written in the ’70s by the real Army officer Major Frank Burns (a psychologist and a nice guy — I met him) who was promoted to Lieutenant Colonel before his retirement and death.